VMware has developed a reputation in some circles as being proprietary and less innovative than it was when the company made server virtualization a household word in the IT space, and it’s trying to change that. Yeah, its bread and butter is still in supporting existing applications on existing virtual infrastructure, but there’s a lot opportunity to make that a much better experience. Bill Fathers, VMware’s executive vice president and general manager of cloud services, came on the Structure Show podcast this week to explain what [company]VMware[/company] is up to in the cloud computing space and how it’s trying to keep pushing the envelope. Here are some of the better quotes from the interview, but you’ll probably want to listen to the whole thing, including for some rather candid assessments and defenses of the company’s business, and the increasing importance of the network. 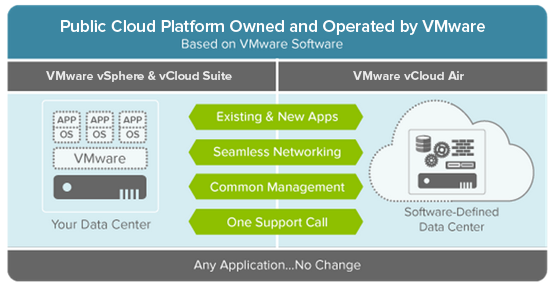 The VMware hybrid cloud, in a diagram. “I am not spending a second working out how you solve what I think is an unsolvable problem of a client who’s marooned an application in AWS and is desperately trying to get it connected securely back to an on-premises app,” Fathers said. “Either way,” he added, “both are probably cheaper, candidly, than buying Exadata or HANA.” Exadata is Oracle’s converged server-database-combo and HANA is SAP’s in-memory database that is now the focal point of its next-gen business applications.